Hi everyone! 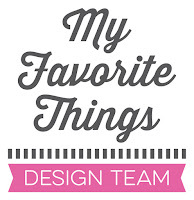 Today is the fourth day of the My Favorite Things November release countdown. This release is packed with amazing new products! Isn’t it? Most of the supplies I used for this project are linked in the list at the bottom of this post. I created the background using the Radiating Rays stencil that I sponged with Distress inks and Distress Oxide inks. The snowy hills were die cut from white cardstock using the Stitched Basic Edges 2 Die-namics. Your radiating rays are fabulous, Francine! I love how it makes the bear pop on this card...so CUTE! Beautiful Copic coloring, too...so much depth and dimension! I love your beautiful background. Very cute. Wow! The skiing bear is a perfect match with the awesome background! So much character! The background really pops! How clever! Amazing coloring!Love the background!The way the stars are placed make it look like there is a real sparkling light!Thank you for the inspiration! 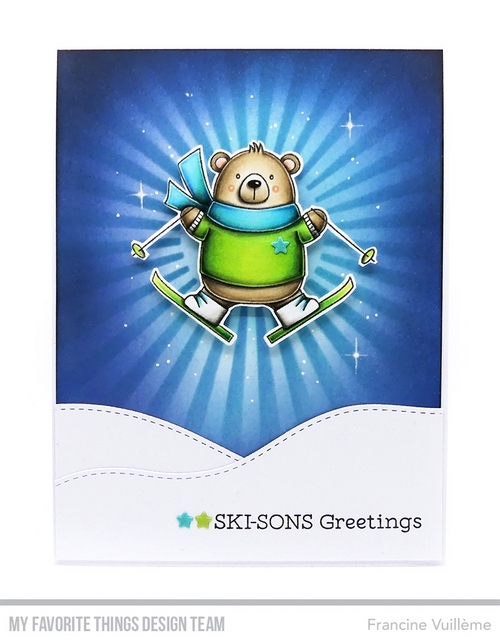 Love that fabulous background for your cute skiing bear. This is great! So much movement! Francine, this is utterly adorable! I love the rays behind the cute little skier. Wow !!! Awesome card !! The radiating rays look like there are actual light rays behind your wonderfully coloured image! Your colouring never ceases to amaze me. OH!! Cute as ever! What a fun set to play with! That bear is just awesome !